Enjoy Receiving The Seed Piece? work which includes The Seed Piece. Thanks! Wood Prairie Farm's Jim Gerritsen Speaks in Missouri. Special Offer: FREE Vermont Compost Organic Soil Mix. Mailbox: Helping Neighbors and Protection From Trespass. A Nice Place to Visit But Maine is Home. Jim enjoyed his eventful trip to Springfield in southern Missouri near Branson, earlier this month. For the first time in 23 years he saw star farm-hand Jenn Folk Muno who worked for us right after college - before returning to her family’s farm outside Columbia MO. She and her husband Ken then established Goatsbeard Farm and – we have the evidence to prove this - make the best cheese around. It was artistic Jenn who on rainy Maine days traded garden hoe for paint brush and created the early drawings used in our Potato Postcards. The MOA conference was a unique one with a lot of Mennonite and Amish farmers in attendance. One could not help but notice many young farm families with their gaggles of well-behaved children. Maybe the most fun was playing hooky one day and heading out to iconic Bakersville. Find more details in the next article plus the link to the YouTube video of Jim’s talk. 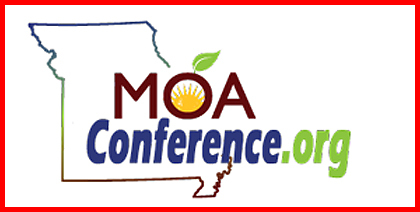 Earlier this month, organizers of the Missouri Organic Association Conference asked Jim to come down and speak. The MOA folks had him doing double-duty. He gave both a talk on growing organic potatoes and moderated an all-day GMO Plenary Session. This latter educational session was focused on the multitude of problems associated with GE crops and included some very powerful and impactful speakers. 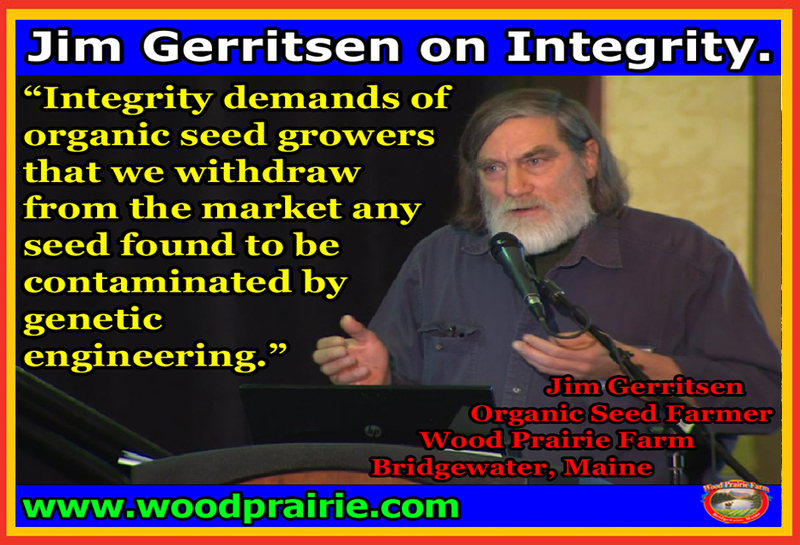 Jim’s talk, The Unacceptable Threat GE Crops Pose to Organic Integrity, was recorded by the crew from Karen Kapnick’s Kreative Konnections. View it on You Tube (45:35), complete with the slides from Jim’s power point presentation. Jim’s presentation ranged on topics from organic farming in Maine to threats faced by organic farmers everywhere. He offered strategic solutions to the growing GE dilemma including elaboration on the Public Trust Doctrine, the Organic Seed Growers and Trade Assn et al v. Monsanto landmark federal lawsuit and the new peer-reviewed OSGATA publication, Protecting Organic Seed Integrity, The Organic Farmers Handbook to GE Avoidance and Testing. While in southern Missouri, one day Jim was able to fulfill what is most every gardener’s dream. He drove the hour from Springfield to the legendary “Bakersville,” home to our friends at Baker Creek Heirloom Seed Company in the Ozarks outside Mansfield, Missouri. Now, believe us, Bakersville is something you will want to add to your bucket list. 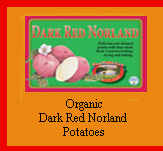 Click Here for Our Wood Prairie Farm Organic Maine Certified Seed Potatoes. For many gardeners it’s just about time to start indoor seeding of important garden vegetables like Onions, Tomatoes and Peppers. 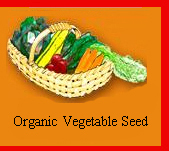 Recently we came across this nice free primer on seed starting from Organic Gardening magazine. This year, start your seed sowing project on a successful foundation by using the same mix we use on our organic seeds on Wood prairie Farm. We use our friend Karl Hammer’s Vermont Compost Fort Vee Organic Soil Mix, and so should you! We’ll help you get started with this year’s seed sowing. Get a FREE 6-Quart Sack of Vermont Compost Fort Vee Organic Soil Mix (Value $12.95) when the amount of goods in your next order totals $55 or more. 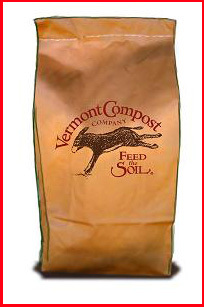 FREE 6-Quart Sack of Vermont Compost Fort Vee Organic Soil Mix offer ends Midnight Monday, February 23, 2015. Please use Promo Code WPF 449. Your order and the FREE 6 Quart Sack of Vermont Compost Fort Vee Organic Soil Mix must ship by 5/5/15. This offer may not be combined with other offers. Please call or click today! Questions? Call Wood Prairie Farm (800) 829-9765. Vermont Compost. The very best organic soil mix. Snow-Covered Remains. Nothing salvageable left. 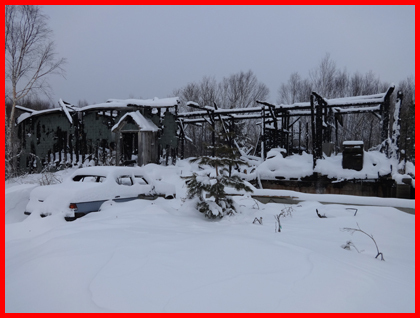 In the last issue of the Seed Piece, we highlighted the very sad story of our elder neighbor Louisa who lost everything – home, pets and all – in a tragic fire in subzero temperatures on February 9. The community has rallied around Louisa and established a GoFundMe crowdfunding project with the express purpose of building her a new modest home. Donations are still urgently needed. Louisa had been transferred from the hospital in Presque Isle down to Bangor. She is coming along well. She is out of I.C.U., the tube in her throat has been removed and her sedation has ended. Her daughter took the bus up from New Jersey and has been bedside with her at the hospital. The hope and expectation is Louisa will stay with her daughter down south until the snow leaves here in the Spring. Our neighbors and friends, Allie and Mitch Wheeler – who live across Bootfoot Road from Louisa – are coordinating the help. Allie has written three Updates so far and they provide additional details. The plan is that if donations continue to flow and we successfully meet the financial goal, Louisa’s neighbors will have put together a new snug and safe home for her by the time the dandelions are blooming. Louisa is without the resources to recover from this disaster on her own. We very much need your help! If you are able, please donate to help Louisa get back on her feet. Even small donations help because they do add up quickly. Click Here to Donate to Help Louisa Get a New Home. In a small bowl, sprinkle the yeast onto the warm water and stir until the yeast dissolves. Stir in the honey and set aside for a few minutes, until the yeast blooms and swells a bit, 5-10 minutes. In the meantime, mix the flours, oats, and salt in a large bowl. Add the wet mixture to the dry and stir very well. 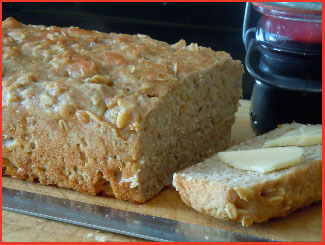 Brush a 8-cup loaf pan generously with some of the melted butter. Turn the dough into the tin, cover with a clean, slightly damp cloth, and set in a warm place for 30 minutes, to rise. Preheat the oven to 350ºF. When ready, bake the bread for 35-40 minutes, until golden and pulling away from the sides of the pan. You can finish things up by leaving the bread under the broiler for just a heartbeat - to give the top a bit deeper color. Remove from oven, and turn the bread out of the pan quickly. Let it cool on a rack so it doesn't steam in the pan. Brush on remaining melted butter on top of loaf. Serve warm, slathered with butter and your favorite jam. There is no kneading involved with this bread and it only rises for 30 minutes. Super quick and easy. It is moist with a crispy crust and very yummy. It's a keeper. Our Mailbox: Helping Neighbors and Protection From Trespass. Thanks so much. Yes I think Wyoming and Maine people probably do have a lot in common. Megan worked in Jackson Hole one Summer during college and has stories to tell. We need to do one final push to get us over the hump for Louisa. What we've learned from farming is it always takes more cash than planned to get a job done. With our Winters, plumbing for year-round water will entail more expense than a three-season camp. So I really hope we can shoot past the current $10,000 goal. I just finished my USDA Organic survey. I must have missed this in the past, however, I thought it was rather strange that USDA asked in specific terms if "you had any VERIFIABLE GMO contamination and what the loss of revenue was due to this VERIFIABLE contamination." First, we would have to have every vegetable we grow tested (and I am assuming there is a cost) and second even if we suspected we had contamination we would have to hold up the crop until we got confirmation. We are a specialty crop truck-farm. If we held our product up only to find out it was not tainted then we would have a loss w/out verifiable data. Seems like a catch-22 but it also makes we think they are compiling data so USDA can come out and say there is little to no cross-contamination in organic crops from GMO. Have you dealt with GMO testing and if so, what lab did you use and at what cost? We use Genetics ID to PCR lab test seed crops at-risk of GE contamination. The limit of detectability is 0.01%. So we provide 10,000 representative seeds from one seed lot and they can identify if one of those seeds is hot with GE contamination. Were the test to show contamination, we would abide by the OSGATA policy and pull that seed lot and NOT sell it as Certified Organic seed. Cost of the test is $200. Fortunately, the spectrum of GE crops which have been de-regulated (allowed for farmers to grow commercially) is to date narrow. As a result, only closely related traditional crops which have a GE version are at risk of contamination. Deregulated GE crops include corn, soy, canola (can contaminate certain families of cole crops), cotton, sugar beets (can contaminate members of the Beta family including table beets and Swiss Chard), alfalfa, papaya and two species of summer squash and now apples. Many other GE versions of crops are awaiting regulatory approval. I think there is reason to be concerned about this question on the survey. USDA may use this Census info to argue that GE contamination is a minor problem. If so, that would be another intellectually dishonest move by USDA. One study I have seen (published in a 2011 Organic Trade Association white paper) tested nearly 2500 organic corn samples and found 30% with some level of GE contamination. The problem of GE contamination is an enormous one. Organic farmers possess property rights and we must be protected from unwanted trespass by the patented technology of multinational Biotech corporations.